On the limestone in Northern Jutland grow several plant species as the only places in Denmark. One of the few endemic plants in Denmark, Euphrasia dunensis (a species of Eyebright), can be found on Bulbjerg. 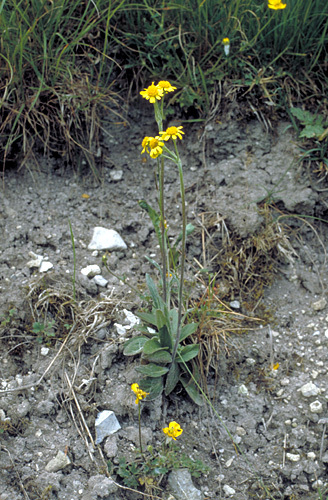 Other peculiarities of the plant-life on Bulbjerg includes dwarf-races of the common Goldenrod (Solidago virgaurea) and Spotted Cat's-ear (Hypochoeris maculata). The Goldenrod is only a few centimeters high. In the strong winds from the sea it is an advantage being small. Field Fleawort (Cineraria (Senecio) integrifolia) (left picture) can be found many places in Northern Jutland on limestone slopes, eg. at Febbersted. Its main distribution is the calcerous mountains in Central Europe. Other species with this type of distribution is Gentianella amarella and Polygala amarella, which has allmost all of their danish sites in Northern Jutland. These 3 species are considered relics from the time just after the end of the Last Ice Age. 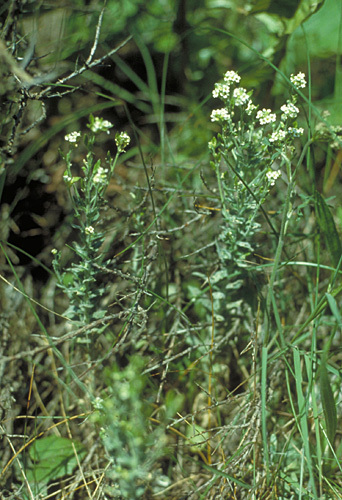 The Hoary Whitlowgrass (Draba incana) in the right picture is also a speciality from the limestone in Northern Jutland. It has a northern distribution in Europe with sites in Scandinavia, Iceland and Greenland. Back to The limestone in Thy.